Let’s start with the redone Mustang, Braised Korean boneless beef short rib, house-made Kimchi, crispy daikon strings, melted havarti cheese and Saracha/wasabi aoli grilled on brioche bread. I had said that it didn’t taste Korean, the kimchi had no kick/bite, and it needed more cheese. Well 2 out of 3 ain’t bad. They kicked up the flavoring in the beef and gave more bite to the kimchi. 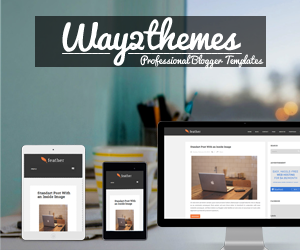 Drew had scaled it back originally because he wanted to keep it mild for broader appeal. But the Chef Lai and I (and others from Sat.) agreed that if it says Korean and kimchi in the ingredients, then we have certain expectations that need to be met. This new version is still on the mild side, but has the flavor profile that matches the advertising. My final suggestion to them - put a bottle of the saracha aioli sauce out for customers who want to add more. I did pour a bit extra in my plate to dip in and it really lifted the sandwich another notch higher! We’ll skip to the tater tots next. For some reason tots just seem to come out better on these trucks than actual fries. Not sure why that is. 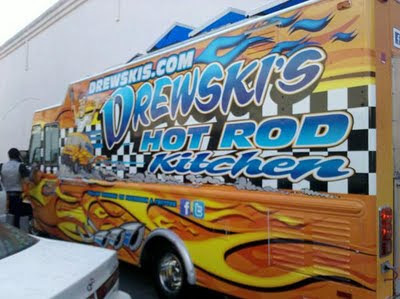 Drewski’s offers sweet potato fries and regular tots (opposite Miniburger doing regular fries and sweet potato tots – haha!). Drewski’s also offers either dressed with garlic, rosemary, and parmesan for a dollar extra. They gave me a serving of the dressed up tots which I wanted to try, but knew I couldn’t finish. I shared my goodwill by letting folks in line sample them. These are definitely another winner and worth the extra buck. Not too strong, but enough to taste the flavorings. Finally I sampled the other signature sandwich, the Hemi. 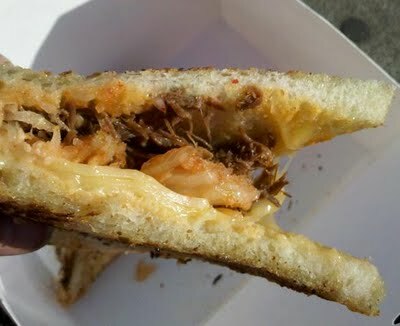 As I mentioned in my sandwich post, the original sandwich (at least as far as lore goes) was from the Grilled Cheese Truck in Los Angeles. 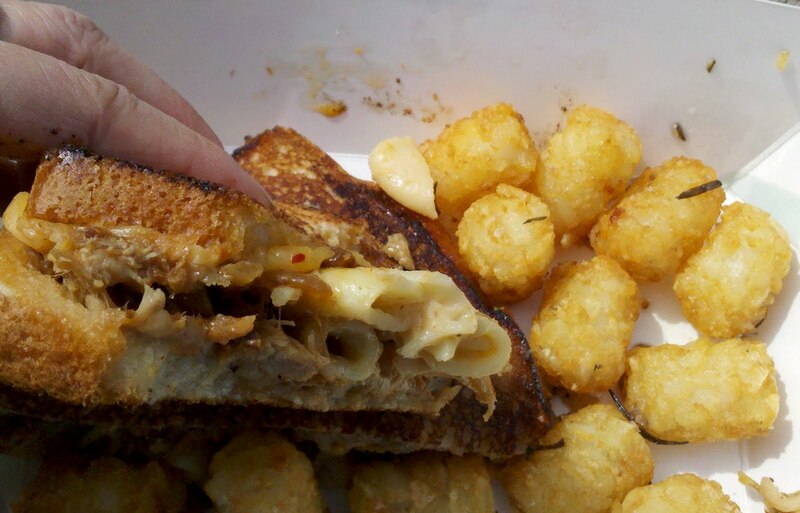 Grilled cheese with mac n cheese, caramelized onions, and pulled pork inside. Drewski’s has the same and is another handheld feast. There is sweet goodness (or good sweetness) from the caramelized onions. Again, as a sauce person, I could see having a bottle of BBQ out for those who want to add an extra squirt or two. Oh, and did I mention the bread is grilled with a garlic clarified butter?!?! Seriously, this truck is dangerous calorie and fat count-wise. Good thing my new philosophy is that there are no calories from food truck food (not!). I mean, if you haven’t done yourself enough arterial damage, then you should just go for it and order dessert too. They sell crème brulee! Yes, I said crème brulee! Only one of my top desserts. Seeing that I’m in serious food coma mode as it, this will have to wait for another day. Perhaps SactoMoFo. Note: This post was written before I had developed a working relationship with Drewski's.